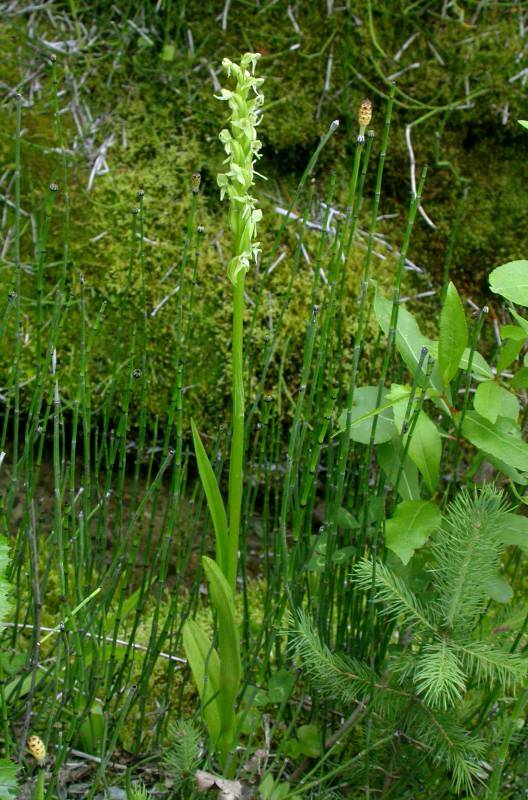 Notes: Hybridizes with Platanthera dilatata in Wallowa Co., Oregon. Difficult to distinguish from Platanthera aquilonis. Platanthera hyperborea, the name formerly used for members of this complex in the PNW, is a poorly understood species endemic to Greenland and Iceland. We follow FNA for taxonomy and treat the authorship of H. hyperborea as (L.) R. Br. in Ait., Hort. Kew. ed. 2. 5: 193 (1813); not (L.) R. Br. ex Ait. f. as in KZ. FNA26: "Northwestern plants commonly treated as Platanthera hyperborea var. viridiflora (Chamisso) Kitamura (note Kitamura's priority over Luer) are P. huronensis; Chamisso's name furthermore is synonymous with P. stricta. Aleutian and coastal Alaskan plants are often short, stout, and broad-leaved, and they have incorrectly been referred to 9. P. convallariifolia. Platanthera huronensis as here delimited does not auto-pollinate in the manner of P. aquilonis. Occasional plants and populations that may be referable to P. huronensis, however, exhibit the movement of pollinia typical of P. aquilonis. These plants might reflect infraspecific variation within an allotetraploid species, result from hybridization, or constitute a distinct taxon. The relationship of some of these plants to P. hyperborea needs study. Platanthera huronensis is typically intensely fragrant with the sweet, pungent scent of some related species. Platanthera huronensis is known to hybridize with P. dilatata; it may hybridize with other species as well. Although hybrids of P. dilatata and P. aquilonis may occur, the name traditionally used for them, P. ×media (Rydberg) Luer is a synonym of P. huronensis. See notes under 10. P. aquilonis and 8. P. hyperborea." » Catling, P. M. & V. R. Catling. 1989. Observations of the pollination of Platanthera huronensis in southwest Colorado. Lindleyana 4: 78-84. » Sheviak, C. J. 1999a. Platanthera hyperborea and a reappraisal of green platantheras. No. Am. Native Orchid Journ. 5: 117-141; 198.